Fibromyalgia has been described as a chronic condition characterized by widespread musculoskeletal pain, sleep disorders and prominent fatigue [1Palagini L, Carmassi C, Conversano C, et al. Transdiagnostic factors across fibromyalgia and mental disorders: Sleep disturbances may play a key role. A clinical review. Clin Exp Rheumatol 2016; 34(2)(Suppl. 96): S140-4. [PMID: 27157399] ]. The prevalence of fibromyalgia as a rheumatic disease has shown to be between 0.2 and 6.6% in the general population, between 2.4 and 6.8% in women and between 0.7 and 11.4% in urban areas [2Marques AP, do Espírito Santo ADS, Berssaneti AA, Matsutani LA, Yuan SLK. Prevalence of fibromyalgia: Literature review update 2017; 57(4): 356-63. [http://dx.doi.org/10.1016/j.rbre.2017.01.005] ]. Worldwide, researchers are still debating on the as yet unclear etiopathogenesis of fibromyalgia which could comprise genetic predisposition, environmental factors, an influence on the neuroendocrine functions and the contribution of immune system [3Bellato E, Marini E, Castoldi F, et al. Fibromyalgia syndrome: Etiology, pathogenesis, diagnosis, and treatment. Pain Res Treat 2012; 2012: 426130. [http://dx.doi.org/10.1155/2012/426130] [PMID: 23213512] ]. A recent work [4Park DJ, Lee SS. New insights into the genetics of fibromyalgia. Korean J Intern Med (Korean Assoc Intern Med) 2017; 32(6): 984-95. [http://dx.doi.org/10.3904/kjim.2016.207] [PMID: 29056037] ] revealed how certain gene polymorphisms (especially those influencing serotoninergic, dopaminergic and catecholaminergic systems) could be directly involved in fibromyalgia development, with an influence on susceptibility and symptoms severity. Jiao and colleagues [5Jiao J, Vincent A, Cha SS, Luedtke CA, Kim CH, Oh TH. Physical trauma and infection as precipitating factors in patients with fibromyalgia. Am J Phys Med Rehabil 2015; 94(12): 1075-82. [http://dx.doi.org/10.1097/PHM.0000000000000300] [PMID: 25888651] ] observed the role of physical trauma and infection as a precipitating factor, while another study [6Ji RR, Chamessian A, Zhang YQ. Pain regulation by non-neuronal cells and inflammation. Science 2016; 354(6312): 572-7. [http://dx.doi.org/10.1126/science.aaf8924] [PMID: 27811267] ] suggested that regulation of pain process can be influenced by viral or bacterial infection throughout the activation of a specific type of cytokines. In his critical review, Di Tella M, et al. [7Di Tella M, Castelli L, Colonna F, et al. Theory of mind and emotional functioning in fibromyalgia syndrome: An investigation of the relationship between social cognition and executive function. PLoS One 2015; 10(1): e0116542. [http://dx.doi.org/10.1371/journal.pone.0116542] [PMID: 25594169] ] highlighted that central sensitization could play an important role in fibromyalgia syndrome; in fact, the high sensitization to noxious stimuli can lead to hyperalgesia or allodynia and equate different clinical conditions (central sensitivity syndromes). In a recent review [8Sancassiani F, Machado S, Ruggiero V, et al. The management of fibromyalgia from a psychosomatic perspective: An overview. Int Rev Psychiatry 2017; 29(5): 473-88. [http://dx.doi.org/10.1080/09540261.2017.1320982] [PMID: 28681628] ] fibromyalgia has been described as a central sensitization syndrome characterized by chronic widespread pain. There are other factors that could influence both the onset and the course of fibromyalgia: Eating habits, psychic stress response (as a psychological variable) and lack of social relationships [9Talotta R, Bazzichi L, Di Franco M, et al. One year in review 2017: Fibromyalgia. Clin Exp Rheumatol 2017; 35(3)(Suppl. 105): 6-12. [PMID: 28681712] ]. Nevertheless, patients suffering from this condition have to deal with heterogeneous symptom manifestations, non-resolving treatments and a high prevalence of comorbidity suggesting a complicated diagnostic process [9Talotta R, Bazzichi L, Di Franco M, et al. One year in review 2017: Fibromyalgia. Clin Exp Rheumatol 2017; 35(3)(Suppl. 105): 6-12. [PMID: 28681712] ]. Fibromyalgia often occurs in comorbidity with psychiatric conditions of various kinds, including mood disorders and anxiety disorders [10Conversano C, Carmassi C, Bertelloni CA, et al. Potentially traumatic events, PTSD and post-traumatic stress spectrum in patients with fibromyalgia. Clin Exp Rheumatol 2018. [PMID: 29745889] -13Dell’Osso L, Bazzichi L, Baroni S, et al. The inflammatory hypothesis of mood spectrum broadened to fibromyalgia and chronic fatigue syndrome. Clin Exp Rheumatol 2015; 33(1)(Suppl. 88): S109-16. [PMID: 25786052] ]. Specifically, some studies highlighted high percentages of major depression (comorbidity rates range from 20 to 80%), dysthymia and Generalized Anxiety Disorder [14Cathébras P, Lauwers A, Rousset H. Fibromyalgia: A critical review. Ann Med Interne (Paris) 1998; 149(7): 406-14. [PMID: 9921393] -16González E, Elorza J, Failde I. Fibromyalgia and psychiatric comorbidity: Their effect on the quality of life patients. Actas Esp Psiquiatr 2010; 38(5): 295-300. [PMID: 21117004] ] in FM patients. Specialists have used the well-known 1990 criteria of the American College of Rheumatology [17Wolfe F, Smythe HA, Yunus MB, et al. The american college of rheumatology 1990 criteria for the classification of fibromyalgia. Arthritis Rheum 1990; 33(2): 160-72. [http://dx.doi.org/10.1002/art.1780330203] [PMID: 2306288] ] for approximately 20 years to diagnose fibromyalgia [18Wolfe F. Editorial: The status of fibromyalgia criteria. Arthritis Rheumatol 2015; 67(2): 330-3. [http://dx.doi.org/10.1002/art.38908] [PMID: 25303359] ]. These criteria required a minimum of three months of extended widespread pain (with no distinctions regarding side of body) and a sensitivity to digital palpation on at least 11 particular body sites named tender points. Many studies have criticized the choice of tender points, suggesting that it is not possible to detect pressure pain in these points while they represent a good measure for prolonged negative effects of stress. A recent study [19Katz RS, Wolfe F, Michaud K. Fibromyalgia diagnosis: A comparison of clinical, survey, and american college of rheumatology criteria. Arthritis Rheum 2006; 54(1): 169-76. [http://dx.doi.org/10.1002/art.21533] [PMID: 16385512] ] aimed to explain why the so-called tender points pressure method has no diagnostic sensitivity. This approach seems to not be capable of equally representing men and women's physical condition due to their demonstrated differences concerning tender point location and quantity in the body. The new criteria were revealed in 2010 and the main purposes were to simplify the diagnostic process and to include non-painful symptoms, such as sleep disturbances (especially non-restorative sleep) and various cognitive disorders (such as the so-called ‘fibro fog’). Another purpose was to shift the overview of fibromyalgia from a peripheral condition concept to a systemic one, to support the multifactorial and complex nature of the disease. For this, new criteria include self-reported evaluations of a Widespread Pain Index and a Symptom Severity Scale which also comprehend cognitive functioning and sleep quality assessment [20Novo R, Gonzalez B, Peres R, Aguiar P. A meta-analysis of studies with the minnesota multiphasic personality inventory in fibromyalgia patients. Pers Individ Dif 2017; 116(96): 108. [http://dx.doi.org/10.1016/j.paid.2017.04.026] ]. The new female: male ratio diagnosed by using the new criteria is 2:1 [21Wolfe F, Clauw DJ, Fitzcharles MA, et al. The american college of rheumatology preliminary diagnostic criteria for fibromyalgia and measurement of symptom severity. Arthritis Care Res (Hoboken) 2010; 62(5): 600-10. [http://dx.doi.org/10.1002/acr.20140] [PMID: 20461783] ] and the assessment is made by a global evaluation using a shorter symptoms checklist among other things. As a matter of fact, many researchers have studied the role of personality factors in fibromyalgia. Many studies have focused both on personality traits or particular characteristics and psychopathology aspects in a narrow sense. In this regard, a recent meta-analysis [22Novo R, Gonzalez B, Peres R, Aguiar P. A meta-analysis of studies with the minnesota multiphasic personality inventory in fibromyalgia patients. Pers Individ Dif 2017; 116: 96-108. [http://dx.doi.org/10.1016/j.paid.2017.04.026] ] highlighted significant statistical differences in clinical profiles between FM patients and healthy controls. More specifically, the research group identified three different sub-groups in FM patients: One group with the neurotic triad profile (elevation on hypochondrias, depression and hysteria scores), another group with a normal profile (absence of significant high-ranked scales) and a group with a psychopathological profile (high scores in at least 4 scales). Another recent analysis [22Novo R, Gonzalez B, Peres R, Aguiar P. A meta-analysis of studies with the minnesota multiphasic personality inventory in fibromyalgia patients. Pers Individ Dif 2017; 116: 96-108. 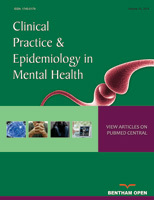 [http://dx.doi.org/10.1016/j.paid.2017.04.026] ] investigating several different studies on prevalence of borderline personality disorder in patients with FM and chronic fatigue, showed inconsistent results on prevalence estimation (from 1% to 16.7%). Kayhan et al. [23Kayhan F, Küçük A, Satan Y, İlgün E, Arslan Ş, İlik F. Sexual dysfunction, mood, anxiety, and personality disorders in female patients with fibromyalgia. Neuropsychiatr Dis Treat 2016; 12: 349. [http://dx.doi.org/10.2147/NDT.S99160] ] demonstrated that, with the exception of histrionic personality disorder, there are no significant differences between FM group and controls. Likewise, researches dealing with personality traits in fibromyalgia patients have at times shown inconsistent results. Several studies have focused on alexithymia, a personality trait characterized by difficulty in identifying and describing emotions and feelings in FM patients [24Di Tella M, Enrici I, Castelli L, et al. Alexithymia, not fibromyalgia, predicts the attribution of pain to anger-related facial expressions. J Affect Disord 2017; 227: 272-9.] while others have analyzed a specific type of personality, such as type D personality (distressed personality). Previously exposed personality traits included high negative affectivity (tendency to experience negative feelings) and social inhibition (low propensity to express emotions to others, owing to social disapproval or rejection [25Lambertus F, Herrmann-Lingen C, Fritzsche K, et al. Prevalence of mental disorders among depressed coronary patients with and without type D personality. Results of the multi-center SPIRR-CAD trial. Gen Hosp Psychiatry 2018; 50: 69-75. [http://dx.doi.org/10.1016/j.genhosppsych.2017.10.001] [PMID: 29078170] ]. Many studies that centered on aspects such as neuroticism and/or extroversion [26Bucourt E, Martaillé V, Mulleman D, et al. Comparison of the big five personality traits in fibromyalgia and other rheumatic diseases. Joint Bone Spine 2017; 84(2): 203-7. [http://dx.doi.org/10.1016/j.jbspin.2016.03.006] [PMID: 27269650] , 27Montoro CI, del Paso GAR. Personality and fibromyalgia: Relationships with clinical, emotional, and functional variables. Pers Individ Dif 2015; 85: 236-44. [http://dx.doi.org/10.1016/j.paid.2015.05.017] ] highlighted that only some patients have shown significant differences in profiles when compared with healthy controls. Furthermore, various researchers discussed the specific role played by personality traits on fibromyalgia: Some studies investigated personality as a predisposing factor in the onset and maintenance of the disease [28Ablin JN, Zohar AH, Zaraya-Blum R, Buskila D. Distinctive personality profiles of fibromyalgia and chronic fatigue syndrome patients. Peer J 2016; 4: e2421. [http://dx.doi.org/10.7717/peerj.2421] [PMID: 27672497] , 29Malin K, Littlejohn GO. Psychological factors mediate key symptoms of fibromyalgia through their influence on stress. Clin Rheumatol 2016; 35(9): 2353-7. [http://dx.doi.org/10.1007/s10067-016-3315-9] [PMID: 27245234] ] while others as a moderation factor compared to the disease’s adaptation process. For this reason, analyzing scientific literature on this subject seems to be fundamental in order to provide a critical review of the latest studies and their results. other rheumaticdiseases and comorbidities (n=41). The final number of articles enrolled in this study was 24, of which the full texts were examined independently. We decided to exclude a review about borderline personality disorder [31Penfold S, Denis ES, Mazhar MN. 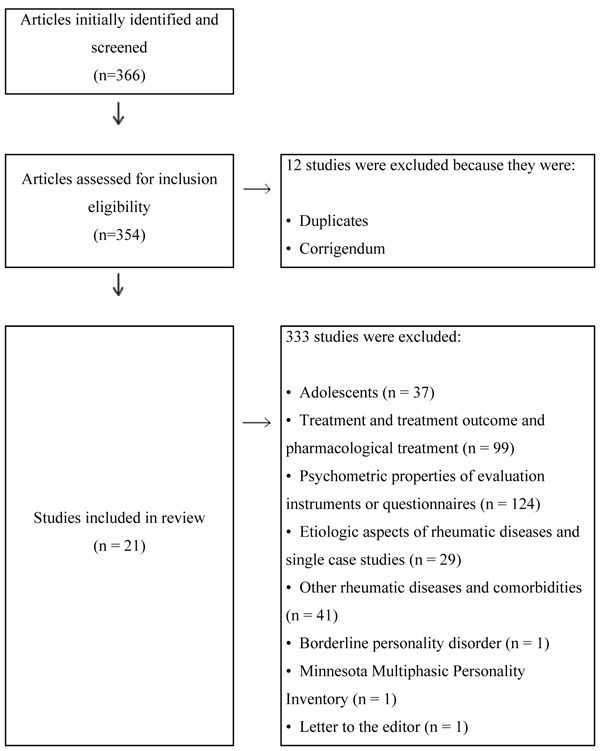 The association between borderline personality disorder, fibromyalgia and chronic fatigue syndrome: Systematic review. Br J Psychiatry Open 2016; 2(4): 275-9. [http://dx.doi.org/10.1192/bjpo.bp.115.002808] ] in fibromyalgia because of its focus on a specific psychopathological disorder, a meta-analysis about the use of Minnesota Multiphasic Personality Inventory (MMPI) [22Novo R, Gonzalez B, Peres R, Aguiar P. A meta-analysis of studies with the minnesota multiphasic personality inventory in fibromyalgia patients. Pers Individ Dif 2017; 116: 96-108. [http://dx.doi.org/10.1016/j.paid.2017.04.026] ] in patients with fibromyalgia for its focus on a specific instrument and, lastly, a letter to the editor about perfectionism [32Sirois FM, Molnar DS. Perfectionism and maladaptive coping styles in patients with chronic fatigue syndrome, irritable bowel syndrome and fibromyalgia/arthritis and in healthy controls. Psychother Psychosom 2014; 83(6): 384-5. [http://dx.doi.org/10.1159/000365174] [PMID: 25323951] ]. The articles examined for this systematic review were definitively 21. (Table 1). Fig. (1 ) presents a flow chart depicting the literature search process. Studies examined in this systematic review. Flow chart for literature search and screening results. aspects of personality analysed in terms of definition, instruments and hypotheses. Regarding Definition and Diagnostic Criteria of Fibromyalgia Twenty studies [2Marques AP, do Espírito Santo ADS, Berssaneti AA, Matsutani LA, Yuan SLK. Prevalence of fibromyalgia: Literature review update 2017; 57(4): 356-63. [http://dx.doi.org/10.1016/j.rbre.2017.01.005] , 3Bellato E, Marini E, Castoldi F, et al. Fibromyalgia syndrome: Etiology, pathogenesis, diagnosis, and treatment. Pain Res Treat 2012; 2012: 426130. [http://dx.doi.org/10.1155/2012/426130] [PMID: 23213512] , 5Jiao J, Vincent A, Cha SS, Luedtke CA, Kim CH, Oh TH. Physical trauma and infection as precipitating factors in patients with fibromyalgia. Am J Phys Med Rehabil 2015; 94(12): 1075-82. [http://dx.doi.org/10.1097/PHM.0000000000000300] [PMID: 25888651] , 6Ji RR, Chamessian A, Zhang YQ. Pain regulation by non-neuronal cells and inflammation. Science 2016; 354(6312): 572-7. [http://dx.doi.org/10.1126/science.aaf8924] [PMID: 27811267] , 19Katz RS, Wolfe F, Michaud K. Fibromyalgia diagnosis: A comparison of clinical, survey, and american college of rheumatology criteria. Arthritis Rheum 2006; 54(1): 169-76. [http://dx.doi.org/10.1002/art.21533] [PMID: 16385512] -26Bucourt E, Martaillé V, Mulleman D, et al. Comparison of the big five personality traits in fibromyalgia and other rheumatic diseases. Joint Bone Spine 2017; 84(2): 203-7. [http://dx.doi.org/10.1016/j.jbspin.2016.03.006] [PMID: 27269650] , 28Ablin JN, Zohar AH, Zaraya-Blum R, Buskila D. Distinctive personality profiles of fibromyalgia and chronic fatigue syndrome patients. Peer J 2016; 4: e2421. [http://dx.doi.org/10.7717/peerj.2421] [PMID: 27672497] , 29Malin K, Littlejohn GO. Psychological factors mediate key symptoms of fibromyalgia through their influence on stress. Clin Rheumatol 2016; 35(9): 2353-7. [http://dx.doi.org/10.1007/s10067-016-3315-9] [PMID: 27245234] , 33Da Silva JAP, Jacobs JWG, Branco JC, et al. Can health care providers recognise a fibromyalgia personality? Clin Exp Rheumatol 2017; 35(3)(Suppl. 105): 43-9. [PMID: 28229820] -41Martínez MP, Sánchez AI, Miró E, Lami MJ, Prados G, Morales A. Relationships between physical symptoms, emotional distress, and pain appraisal in fibromyalgia: The moderator effect of alexithymia. J Psychol 2015; 149(1-2): 115-40. [http://dx.doi.org/10.1080/00223980.2013.844673] [PMID: 25511201] ] defined fibromyalgia as a syndrome characterized by chronic widespread pain and sensitivity to digital palpation and only one study referred to fibromyalgia as a rheumatic disease [35Di Tella M, Ghiggia A, Tesio V, et al. Pain experience in fibromyalgia syndrome: The role of alexithymia and psychological distress. J Affect Disord 2017; 208: 87-93. [http://dx.doi.org/10.1016/j.jad.2016.08.080] [PMID: 27750065] ]. Nineteen of these studies [2Marques AP, do Espírito Santo ADS, Berssaneti AA, Matsutani LA, Yuan SLK. Prevalence of fibromyalgia: Literature review update 2017; 57(4): 356-63. [http://dx.doi.org/10.1016/j.rbre.2017.01.005] , 3Bellato E, Marini E, Castoldi F, et al. Fibromyalgia syndrome: Etiology, pathogenesis, diagnosis, and treatment. Pain Res Treat 2012; 2012: 426130. [http://dx.doi.org/10.1155/2012/426130] [PMID: 23213512] , 5Jiao J, Vincent A, Cha SS, Luedtke CA, Kim CH, Oh TH. Physical trauma and infection as precipitating factors in patients with fibromyalgia. Am J Phys Med Rehabil 2015; 94(12): 1075-82. [http://dx.doi.org/10.1097/PHM.0000000000000300] [PMID: 25888651] , 6Ji RR, Chamessian A, Zhang YQ. Pain regulation by non-neuronal cells and inflammation. Science 2016; 354(6312): 572-7. [http://dx.doi.org/10.1126/science.aaf8924] [PMID: 27811267] , 19Katz RS, Wolfe F, Michaud K. Fibromyalgia diagnosis: A comparison of clinical, survey, and american college of rheumatology criteria. Arthritis Rheum 2006; 54(1): 169-76. [http://dx.doi.org/10.1002/art.21533] [PMID: 16385512] , 23Kayhan F, Küçük A, Satan Y, İlgün E, Arslan Ş, İlik F. Sexual dysfunction, mood, anxiety, and personality disorders in female patients with fibromyalgia. Neuropsychiatr Dis Treat 2016; 12: 349. [http://dx.doi.org/10.2147/NDT.S99160] , 25Lambertus F, Herrmann-Lingen C, Fritzsche K, et al. Prevalence of mental disorders among depressed coronary patients with and without type D personality. Results of the multi-center SPIRR-CAD trial. Gen Hosp Psychiatry 2018; 50: 69-75. [http://dx.doi.org/10.1016/j.genhosppsych.2017.10.001] [PMID: 29078170] , 26Bucourt E, Martaillé V, Mulleman D, et al. Comparison of the big five personality traits in fibromyalgia and other rheumatic diseases. Joint Bone Spine 2017; 84(2): 203-7. [http://dx.doi.org/10.1016/j.jbspin.2016.03.006] [PMID: 27269650] , 28Ablin JN, Zohar AH, Zaraya-Blum R, Buskila D. Distinctive personality profiles of fibromyalgia and chronic fatigue syndrome patients. Peer J 2016; 4: e2421. [http://dx.doi.org/10.7717/peerj.2421] [PMID: 27672497] , 29Malin K, Littlejohn GO. Psychological factors mediate key symptoms of fibromyalgia through their influence on stress. Clin Rheumatol 2016; 35(9): 2353-7. [http://dx.doi.org/10.1007/s10067-016-3315-9] [PMID: 27245234] , 33Da Silva JAP, Jacobs JWG, Branco JC, et al. Can health care providers recognise a fibromyalgia personality? Clin Exp Rheumatol 2017; 35(3)(Suppl. 105): 43-9. [PMID: 28229820] -41Martínez MP, Sánchez AI, Miró E, Lami MJ, Prados G, Morales A. Relationships between physical symptoms, emotional distress, and pain appraisal in fibromyalgia: The moderator effect of alexithymia. J Psychol 2015; 149(1-2): 115-40. [http://dx.doi.org/10.1080/00223980.2013.844673] [PMID: 25511201] ] add to this basic definition the presence of fatigue, sleep disorders, cognitive impairment and emotional distress. Furthermore, 5 studies [5Jiao J, Vincent A, Cha SS, Luedtke CA, Kim CH, Oh TH. Physical trauma and infection as precipitating factors in patients with fibromyalgia. Am J Phys Med Rehabil 2015; 94(12): 1075-82. [http://dx.doi.org/10.1097/PHM.0000000000000300] [PMID: 25888651] , 19Katz RS, Wolfe F, Michaud K. Fibromyalgia diagnosis: A comparison of clinical, survey, and american college of rheumatology criteria. Arthritis Rheum 2006; 54(1): 169-76. [http://dx.doi.org/10.1002/art.21533] [PMID: 16385512] , 29Malin K, Littlejohn GO. Psychological factors mediate key symptoms of fibromyalgia through their influence on stress. Clin Rheumatol 2016; 35(9): 2353-7. [http://dx.doi.org/10.1007/s10067-016-3315-9] [PMID: 27245234] , 35Di Tella M, Ghiggia A, Tesio V, et al. Pain experience in fibromyalgia syndrome: The role of alexithymia and psychological distress. J Affect Disord 2017; 208: 87-93. [http://dx.doi.org/10.1016/j.jad.2016.08.080] [PMID: 27750065] , 36Di Tella M, Tesio V, Ghiggia A, et al. Coping strategies and perceived social support in fibromyalgia syndrome: Relationship with alexithymia. Scand J Psychol 2018; 59(2): 167-76. [http://dx.doi.org/10.1111/sjop.12405] [PMID: 29110306] ] highlighted the presence of sensitivity to tender points (11/18) as described by ACR criteria for FM diagnosis in 1990 [21Wolfe F, Clauw DJ, Fitzcharles MA, et al. The american college of rheumatology preliminary diagnostic criteria for fibromyalgia and measurement of symptom severity. Arthritis Care Res (Hoboken) 2010; 62(5): 600-10. [http://dx.doi.org/10.1002/acr.20140] [PMID: 20461783] ] while only two studies referred explicitly to the new ACR criteria [13Dell’Osso L, Bazzichi L, Baroni S, et al. The inflammatory hypothesis of mood spectrum broadened to fibromyalgia and chronic fatigue syndrome. Clin Exp Rheumatol 2015; 33(1)(Suppl. 88): S109-16. [PMID: 25786052] ] for its definition and diagnosis. From a methodological perspective, all studies enrolled participants who had been diagnosed with FM: In particular, 7 studies [5Jiao J, Vincent A, Cha SS, Luedtke CA, Kim CH, Oh TH. Physical trauma and infection as precipitating factors in patients with fibromyalgia. Am J Phys Med Rehabil 2015; 94(12): 1075-82. [http://dx.doi.org/10.1097/PHM.0000000000000300] [PMID: 25888651] , 19Katz RS, Wolfe F, Michaud K. Fibromyalgia diagnosis: A comparison of clinical, survey, and american college of rheumatology criteria. Arthritis Rheum 2006; 54(1): 169-76. [http://dx.doi.org/10.1002/art.21533] [PMID: 16385512] , 24Di Tella M, Enrici I, Castelli L, et al. Alexithymia, not fibromyalgia, predicts the attribution of pain to anger-related facial expressions. J Affect Disord 2017; 227: 272-9., 26Bucourt E, Martaillé V, Mulleman D, et al. Comparison of the big five personality traits in fibromyalgia and other rheumatic diseases. Joint Bone Spine 2017; 84(2): 203-7. [http://dx.doi.org/10.1016/j.jbspin.2016.03.006] [PMID: 27269650] , 33Da Silva JAP, Jacobs JWG, Branco JC, et al. Can health care providers recognise a fibromyalgia personality? Clin Exp Rheumatol 2017; 35(3)(Suppl. 105): 43-9. [PMID: 28229820] , 34Di Tella M, Castelli L, Colonna F, et al. Theory of mind and emotional functioning in fibromyalgia syndrome: An investigation of the relationship between social cognition and executive function. PLoS One 2015; 10(1): e0116542. [http://dx.doi.org/10.1371/journal.pone.0116542] [PMID: 25594169] , 41Martínez MP, Sánchez AI, Miró E, Lami MJ, Prados G, Morales A. Relationships between physical symptoms, emotional distress, and pain appraisal in fibromyalgia: The moderator effect of alexithymia. J Psychol 2015; 149(1-2): 115-40. [http://dx.doi.org/10.1080/00223980.2013.844673] [PMID: 25511201] ] recruited participants among those who had been diagnosed by expert rheumatologists and fibromyalgia hospital unit outpatients. In three studies [35Di Tella M, Ghiggia A, Tesio V, et al. Pain experience in fibromyalgia syndrome: The role of alexithymia and psychological distress. J Affect Disord 2017; 208: 87-93. [http://dx.doi.org/10.1016/j.jad.2016.08.080] [PMID: 27750065] , 36Di Tella M, Tesio V, Ghiggia A, et al. Coping strategies and perceived social support in fibromyalgia syndrome: Relationship with alexithymia. Scand J Psychol 2018; 59(2): 167-76. [http://dx.doi.org/10.1111/sjop.12405] [PMID: 29110306] , 39Leombruni P, Zizzi F, Miniotti M, et al. Harm Avoidance and self-Directedness characterize fibromyalgic patients and the symptom severity. Front Psychol 2016; 20[http://dx.doi.org/10.3389/fpsyg.2016.00579] ], participants were selected from previously used databases. Ten studies clearly used the ACR criteria to select participants with FM; in one study the participants were described as people who meet the ACR criteria, without other specifications [37Gumà-Uriel L, Peñarrubia-María MT, Cerdà-Lafont M, et al. Impact of IPDE-SQ personality disorders on the healthcare and societal costs of fibromyalgia patients: A cross-sectional study. BMC Fam Pract 2016; 17(1): 61. [http://dx.doi.org/10.1186/s12875-016-0464-5] [PMID: 27245582] ], 7 referring to ACR criteria of 1990 [2Marques AP, do Espírito Santo ADS, Berssaneti AA, Matsutani LA, Yuan SLK. Prevalence of fibromyalgia: Literature review update 2017; 57(4): 356-63. [http://dx.doi.org/10.1016/j.rbre.2017.01.005] , 3Bellato E, Marini E, Castoldi F, et al. Fibromyalgia syndrome: Etiology, pathogenesis, diagnosis, and treatment. Pain Res Treat 2012; 2012: 426130. [http://dx.doi.org/10.1155/2012/426130] [PMID: 23213512] , 6Ji RR, Chamessian A, Zhang YQ. Pain regulation by non-neuronal cells and inflammation. Science 2016; 354(6312): 572-7. [http://dx.doi.org/10.1126/science.aaf8924] [PMID: 27811267] , 23Kayhan F, Küçük A, Satan Y, İlgün E, Arslan Ş, İlik F. Sexual dysfunction, mood, anxiety, and personality disorders in female patients with fibromyalgia. Neuropsychiatr Dis Treat 2016; 12: 349. [http://dx.doi.org/10.2147/NDT.S99160] , 25Lambertus F, Herrmann-Lingen C, Fritzsche K, et al. Prevalence of mental disorders among depressed coronary patients with and without type D personality. Results of the multi-center SPIRR-CAD trial. Gen Hosp Psychiatry 2018; 50: 69-75. [http://dx.doi.org/10.1016/j.genhosppsych.2017.10.001] [PMID: 29078170] , 29Malin K, Littlejohn GO. Psychological factors mediate key symptoms of fibromyalgia through their influence on stress. Clin Rheumatol 2016; 35(9): 2353-7. [http://dx.doi.org/10.1007/s10067-016-3315-9] [PMID: 27245234] , 39Leombruni P, Zizzi F, Miniotti M, et al. Harm Avoidance and self-Directedness characterize fibromyalgic patients and the symptom severity. Front Psychol 2016; 20[http://dx.doi.org/10.3389/fpsyg.2016.00579] ] and only 3 used the 2010 criteria [28Ablin JN, Zohar AH, Zaraya-Blum R, Buskila D. Distinctive personality profiles of fibromyalgia and chronic fatigue syndrome patients. Peer J 2016; 4: e2421. [http://dx.doi.org/10.7717/peerj.2421] [PMID: 27672497] , 38Gonzalez B, Baptista TM, Branco JC, Novo RF. Fibromyalgia characterization in a psychosocial approach. Psychol Health Med 2015; 20(3): 363-8. [http://dx.doi.org/10.1080/13548506.2014.931590] [PMID: 24964249] , 30Moher D, Liberati A, Tetzlaff J, Altman DG. Linee guida per il reporting di revisioni sistematiche e meta-analisi: Il PRISMA statement. PLoS Med 2009; 6(7): e1000097. [http://dx.doi.org/10.1371/journal.pmed.1000097] [PMID: 19621072] ]. Regarding Aspects of Personality The examined studies focused on various aspects of personality associated with FM and highlighted different roles for these aspects compared to FM. Five articles used the term “personality traits” to identify specific psychopathological elements in FM patients, pointing out the role of personality disorders, anxiety, depression as characteristics of a subgroup of patients [35Di Tella M, Ghiggia A, Tesio V, et al. Pain experience in fibromyalgia syndrome: The role of alexithymia and psychological distress. J Affect Disord 2017; 208: 87-93. [http://dx.doi.org/10.1016/j.jad.2016.08.080] [PMID: 27750065] -37Gumà-Uriel L, Peñarrubia-María MT, Cerdà-Lafont M, et al. Impact of IPDE-SQ personality disorders on the healthcare and societal costs of fibromyalgia patients: A cross-sectional study. BMC Fam Pract 2016; 17(1): 61. [http://dx.doi.org/10.1186/s12875-016-0464-5] [PMID: 27245582] , 40Malin K, Littlejohn GO. Personality and fibromyalgia syndrome. Open Rheumatol J 2012; 6: 273-85. [http://dx.doi.org/10.2174/1874312901206010273] [PMID: 23002409] , 41Martínez MP, Sánchez AI, Miró E, Lami MJ, Prados G, Morales A. Relationships between physical symptoms, emotional distress, and pain appraisal in fibromyalgia: The moderator effect of alexithymia. J Psychol 2015; 149(1-2): 115-40. [http://dx.doi.org/10.1080/00223980.2013.844673] [PMID: 25511201] ]. Other studies examined some specific personality traits such as alexithymia, type D personality, emotional regulation, neuropsychological aspects and dysfunctional beliefs, and used a comprehensive model of personality such as that of Eysenck, Cloninger or the big-five model. As far as neuropsychological aspects are concerned, three studies of the present review focused on this aspect [19Katz RS, Wolfe F, Michaud K. Fibromyalgia diagnosis: A comparison of clinical, survey, and american college of rheumatology criteria. Arthritis Rheum 2006; 54(1): 169-76. [http://dx.doi.org/10.1002/art.21533] [PMID: 16385512] , 26Bucourt E, Martaillé V, Mulleman D, et al. Comparison of the big five personality traits in fibromyalgia and other rheumatic diseases. Joint Bone Spine 2017; 84(2): 203-7. [http://dx.doi.org/10.1016/j.jbspin.2016.03.006] [PMID: 27269650] , 29Malin K, Littlejohn GO. Psychological factors mediate key symptoms of fibromyalgia through their influence on stress. Clin Rheumatol 2016; 35(9): 2353-7. [http://dx.doi.org/10.1007/s10067-016-3315-9] [PMID: 27245234] ]. The reasoning of the authors concerned the complex relationship between the comprehension and regulation of emotional states and the neurological networks that operate the ability required for social cognition. From the authors’ point of view, this executive function related to planning, working memory, attention and inhibition could possibly explain the hypersensitivity to pain and the difficulties in emotional recognition and regulation. Di Tella et al. [34Di Tella M, Castelli L, Colonna F, et al. Theory of mind and emotional functioning in fibromyalgia syndrome: An investigation of the relationship between social cognition and executive function. PLoS One 2015; 10(1): e0116542. [http://dx.doi.org/10.1371/journal.pone.0116542] [PMID: 25594169] ], starting from the model of Miyake et al. [42Miyake A, Friedman NP, Emerson MJ, Witzki AH, Howerter A, Wager TD. The unity and diversity of executive functions and their contributions to complex “frontal lobe” tasks: A latent variable analysis. Cognit Psychol 2000; 41(1): 49-100. [http://dx.doi.org/10.1006/cogp.1999.0734] [PMID: 10945922] ], explained the subcomponents of Executive Function (EF) evaluating the social-cognitive profile of patients with FM and the relationship between the performance on cognitive tasks with that on social tasks. Results showed a significant impairment in social cognition skills in people with FM who highlighted at the same time a substantial independence of this impairment from executive function deficits. Miró et al. [43Miró E, Martínez MP, Sánchez AI, Prados G, Lupiáñez J. Men and women with fibromyalgia: Relation between attentional function and clinical symptoms. Br J Health Psychol 2015; 20(3): 632-47. [http://dx.doi.org/10.1111/bjhp.12128] [PMID: 25557603] ] explored the relationship between attention functioning and the main symptoms of FM with differences between genders and with healthy controls in three attention networks (alertness, orienting and executive control). Findings revealed a general impairment in attention networks for these patients, similar in both males and females. Rosselló et al. [44Rosselló F, Muñoz MA, Duschek S, Montoya P. Affective modulation of brain and autonomic responses in patients with fibromyalgia. Psychosom Med 2015; 77(7): 721-32. [http://dx.doi.org/10.1097/PSY.0000000000000217] [PMID: 26186433] ] evaluated the autonomic and central nervous response during affective startle modulation using the motivational priming hypothesis. They found out that patients are characterized by relevant impairment in affective modulation in response to affective state induction and they suggested the presence of alterations in both attentional and emotional aspects of information processing that could explain the main symptoms of FM. Five studies examined alexithymia in FM patients [5Jiao J, Vincent A, Cha SS, Luedtke CA, Kim CH, Oh TH. Physical trauma and infection as precipitating factors in patients with fibromyalgia. Am J Phys Med Rehabil 2015; 94(12): 1075-82. [http://dx.doi.org/10.1097/PHM.0000000000000300] [PMID: 25888651] -7Di Tella M, Castelli L, Colonna F, et al. Theory of mind and emotional functioning in fibromyalgia syndrome: An investigation of the relationship between social cognition and executive function. PLoS One 2015; 10(1): e0116542. [http://dx.doi.org/10.1371/journal.pone.0116542] [PMID: 25594169] , 17Wolfe F, Smythe HA, Yunus MB, et al. The american college of rheumatology 1990 criteria for the classification of fibromyalgia. Arthritis Rheum 1990; 33(2): 160-72. [http://dx.doi.org/10.1002/art.1780330203] [PMID: 2306288] , 20Novo R, Gonzalez B, Peres R, Aguiar P. A meta-analysis of studies with the minnesota multiphasic personality inventory in fibromyalgia patients. Pers Individ Dif 2017; 116(96): 108. [http://dx.doi.org/10.1016/j.paid.2017.04.026] ]. Alexithymia has been described as a personality trait that includes difficulty in identification and description of emotions and feelings, together with an externally oriented cognitive thinking style [45Bagby RM, Parker JD, Taylor GJ. The twenty-item toronto alexithymia Scale: I. Item selection and cross-validation of the factor structure. J Psychosom Res 1994; 38(1): 23-32. [http://dx.doi.org/10.1016/0022-3999(94)90005-1] [PMID: 8126686] ]. The Toronto Alexithymia Scale (TAS-20), a self-report 20-item questionnaire, was chosen as the fundamental measure of alexithymia in all of these studies [45Bagby RM, Parker JD, Taylor GJ. The twenty-item toronto alexithymia Scale: I. Item selection and cross-validation of the factor structure. J Psychosom Res 1994; 38(1): 23-32. [http://dx.doi.org/10.1016/0022-3999(94)90005-1] [PMID: 8126686] ]. Di Tella et al. [35Di Tella M, Ghiggia A, Tesio V, et al. Pain experience in fibromyalgia syndrome: The role of alexithymia and psychological distress. J Affect Disord 2017; 208: 87-93. [http://dx.doi.org/10.1016/j.jad.2016.08.080] [PMID: 27750065] ] examined the relationship between alexithymia and pain (both sensory and the affective component of pain) in 159 patients with fibromyalgia. The study showed that alexithymic patients exhibited higher level of pain intensity and pain experience (both sensory and affective dimensions) when compared to non-alexithymic ones (controls). Moreover, alexithymic patients showed higher levels of anxiety, depression and emotional distress compared with controls: When controlling anxiety, depression and emotional distress, no correlation was found. Emotional distress was the only predictor on intensity of pain and neither anxiety/depression or alexithymia showed a significant role in pain intensity. The study of Montoro and del Paso [27Montoro CI, del Paso GAR. Personality and fibromyalgia: Relationships with clinical, emotional, and functional variables. Pers Individ Dif 2015; 85: 236-44. [http://dx.doi.org/10.1016/j.paid.2015.05.017] ] revealed that FM patients show higher levels of alexithymia compared with the healthy control group. Similarly, in Martinez et al. [41Martínez MP, Sánchez AI, Miró E, Lami MJ, Prados G, Morales A. Relationships between physical symptoms, emotional distress, and pain appraisal in fibromyalgia: The moderator effect of alexithymia. J Psychol 2015; 149(1-2): 115-40. [http://dx.doi.org/10.1080/00223980.2013.844673] [PMID: 25511201] ] alexithymia was shown to play an important role in predicting the affective aspects of pain. The study found FM group more alexithymia than in controls and when anxiety, depression and pain appraisal variables were controlled, alexithymia lost meaningfulness as a predictor of pain experience and sleep quality. On the other hand, anxiety demonstrated to be highly qualified in predicting pain experience, as depression was the best choice for sleep quality. Difficulty in identifying emotions has proved to have a moderate role in the relationship between pain catastrophizing levels and anxiety. Di Tella and colleagues [24Di Tella M, Enrici I, Castelli L, et al. Alexithymia, not fibromyalgia, predicts the attribution of pain to anger-related facial expressions. J Affect Disord 2017; 227: 272-9.] showed higher levels of alexithymia in FM sample compared with controls; moreover, a positive correlation between alexithymia, anxiety, depression and pain was found. Ablin, et al. [28Ablin JN, Zohar AH, Zaraya-Blum R, Buskila D. Distinctive personality profiles of fibromyalgia and chronic fatigue syndrome patients. Peer J 2016; 4: e2421. [http://dx.doi.org/10.7717/peerj.2421] [PMID: 27672497] ] showed two different personality profiles in a fibromyalgic sample: The first was characterized by higher well-being, more adaptive coping strategies and lower levels of alexithymia with a similar prevalence of type D personality when compared with the general population; the second qualified with lower levels of well-being, less adaptive coping strategies, higher levels of alexithymia and more prevalence of type D personality. Moreover, the author assessed personality aspects from a psychobiological point of view. Van Middendorp et al. [46van Middendorp H, Kool MB, van Beugen S, Denollet J, Lumley MA, Geenen R. Prevalence and relevance of Type D personality in fibromyalgia. Gen Hosp Psychiatry 2016; 39: 66-72. [http://dx.doi.org/10.1016/j.genhosppsych.2015.11.006] [PMID: 26804772] ] found that on this peculiar type 56.5% of FM patients showed distressed personality while type D was associated with mental and physical health. Specifically, the negative affective component was strongly related to the mental health of the sample and type D personality appeared highly prevalent in this group. In their contribution, Ablin and colleagues [28Ablin JN, Zohar AH, Zaraya-Blum R, Buskila D. Distinctive personality profiles of fibromyalgia and chronic fatigue syndrome patients. Peer J 2016; 4: e2421. [http://dx.doi.org/10.7717/peerj.2421] [PMID: 27672497] ] studied the role of alexithymia and type D personality in fibromyalgia and chronic fatigue syndrome, and found in some patients maladaptive profiles with high level of alexithymia and high frequency of type D personality. Additionally, the authors examined all the patients’ personality profiles using a specific model that also other studies adopted: The psychobiological model [28Ablin JN, Zohar AH, Zaraya-Blum R, Buskila D. Distinctive personality profiles of fibromyalgia and chronic fatigue syndrome patients. Peer J 2016; 4: e2421. [http://dx.doi.org/10.7717/peerj.2421] [PMID: 27672497] , 38Gonzalez B, Baptista TM, Branco JC, Novo RF. Fibromyalgia characterization in a psychosocial approach. Psychol Health Med 2015; 20(3): 363-8. [http://dx.doi.org/10.1080/13548506.2014.931590] [PMID: 24964249] , 39Leombruni P, Zizzi F, Miniotti M, et al. Harm Avoidance and self-Directedness characterize fibromyalgic patients and the symptom severity. Front Psychol 2016; 20[http://dx.doi.org/10.3389/fpsyg.2016.00579] , 47Santos DM, Lage LV, Jabur EK, et al. The influence of depression on personality traits in patients with fibromyalgia: A case-control study. Clin Exp Rheumatol 2017; 35(3)(Suppl. 105): 13-9. [PMID: 27782872] ]. As with the study of Ablin et al. [28Ablin JN, Zohar AH, Zaraya-Blum R, Buskila D. Distinctive personality profiles of fibromyalgia and chronic fatigue syndrome patients. Peer J 2016; 4: e2421. [http://dx.doi.org/10.7717/peerj.2421] [PMID: 27672497] ] two other studies investigated personality in FM patients referring to Cloninger’s model, a psychobiological model of personality, that includes both temperamental (harm avoidance, novelty seeking, persistence and reward dependence) and character dimensions of personality (self-transcendence, self-directedness and cooperativeness [39Leombruni P, Zizzi F, Miniotti M, et al. Harm Avoidance and self-Directedness characterize fibromyalgic patients and the symptom severity. Front Psychol 2016; 20[http://dx.doi.org/10.3389/fpsyg.2016.00579] , 47Santos DM, Lage LV, Jabur EK, et al. The influence of depression on personality traits in patients with fibromyalgia: A case-control study. Clin Exp Rheumatol 2017; 35(3)(Suppl. 105): 13-9. [PMID: 27782872] ]. Temperament and Character Inventory (TCI) was applied in all these studies. Ablin et al. [28Ablin JN, Zohar AH, Zaraya-Blum R, Buskila D. Distinctive personality profiles of fibromyalgia and chronic fatigue syndrome patients. Peer J 2016; 4: e2421. [http://dx.doi.org/10.7717/peerj.2421] [PMID: 27672497] ] showed a maladaptive profile of some patients characterized by a high level of harm avoidance and a low level of cooperativeness, self-directedness, persistence and reward dependence. Santos et al. [47Santos DM, Lage LV, Jabur EK, et al. The influence of depression on personality traits in patients with fibromyalgia: A case-control study. Clin Exp Rheumatol 2017; 35(3)(Suppl. 105): 13-9. [PMID: 27782872] ] observed a higher level of harm avoidance and self-transcendence and lower levels of novelty seeking, self-directedness, reward dependence and cooperativeness in patients with FM when compared with controls. When anxiety and depression were controlled, only novelty seeking was associated with FM. Personality is investigated also using the Big-Five model and the model of Eysenck. Three studies [2Marques AP, do Espírito Santo ADS, Berssaneti AA, Matsutani LA, Yuan SLK. Prevalence of fibromyalgia: Literature review update 2017; 57(4): 356-63. [http://dx.doi.org/10.1016/j.rbre.2017.01.005] -4Park DJ, Lee SS. New insights into the genetics of fibromyalgia. Korean J Intern Med (Korean Assoc Intern Med) 2017; 32(6): 984-95. [http://dx.doi.org/10.3904/kjim.2016.207] [PMID: 29056037] , 12Dell’Osso L, Bazzichi L, Consoli G, et al. Manic spectrum symptoms are correlated to the severity of pain and the health-related quality of life in patients with fibromyalgia. Clin Exp Rheumatol 2009; 27(5)(Suppl. 56): S57-61. [PMID: 20074441] ] examined FM patients’ personality according to the five-factor model which includes 5 main dimensions of personality: Extroversion/introversion, openness to experience/closed-minded, conscientiousness/impulsivity, neuroticism/emotional stability, agreeableness/antagonism. Two studies [26Bucourt E, Martaillé V, Mulleman D, et al. Comparison of the big five personality traits in fibromyalgia and other rheumatic diseases. Joint Bone Spine 2017; 84(2): 203-7. [http://dx.doi.org/10.1016/j.jbspin.2016.03.006] [PMID: 27269650] , 29Malin K, Littlejohn GO. Psychological factors mediate key symptoms of fibromyalgia through their influence on stress. Clin Rheumatol 2016; 35(9): 2353-7. [http://dx.doi.org/10.1007/s10067-016-3315-9] [PMID: 27245234] ] employed the Big Five Personality inventory and only one [43Miró E, Martínez MP, Sánchez AI, Prados G, Lupiáñez J. Men and women with fibromyalgia: Relation between attentional function and clinical symptoms. Br J Health Psychol 2015; 20(3): 632-47. [http://dx.doi.org/10.1111/bjhp.12128] [PMID: 25557603] ] the Neo-Personality Inventory (NEO-P-R). Bucourt et al. [26Bucourt E, Martaillé V, Mulleman D, et al. Comparison of the big five personality traits in fibromyalgia and other rheumatic diseases. Joint Bone Spine 2017; 84(2): 203-7. [http://dx.doi.org/10.1016/j.jbspin.2016.03.006] [PMID: 27269650] ] demonstrated how FM patients had higher scores in neuroticism, openness and agreeableness when compared with other rheumatic diseases. Furthermore, significant correlations between neuroticism and pain, and impulsivity and pain in FM group were found. Malin and Littlejohn [29Malin K, Littlejohn GO. Psychological factors mediate key symptoms of fibromyalgia through their influence on stress. Clin Rheumatol 2016; 35(9): 2353-7. [http://dx.doi.org/10.1007/s10067-016-3315-9] [PMID: 27245234] ] proposed a top-down model that assumes several psychological variables (mastery, neuroticism, anxiety) as predictors of stress which could influence FM symptoms (pain, fatigue and sleep disturbances); moreover, both anxiety and neuroticism were associated with stress. In the study of Da Silva et al. [33Da Silva JAP, Jacobs JWG, Branco JC, et al. Can health care providers recognise a fibromyalgia personality? Clin Exp Rheumatol 2017; 35(3)(Suppl. 105): 43-9. [PMID: 28229820] ] various items were selected to represent peculiar FM patients’ personality characteristics in comparison with controls; for the most part, different experts sorted items in the field of neuroticism, revealing good consistency. Montoro and del Paso [27Montoro CI, del Paso GAR. Personality and fibromyalgia: Relationships with clinical, emotional, and functional variables. Pers Individ Dif 2015; 85: 236-44. [http://dx.doi.org/10.1016/j.paid.2015.05.017] ] assessed the three personality dimensions (neuroticism, psychoticism and extroversion) according to Eysenck’s personality model in FM patients with the Eysenck Personality Questionnaire Revised-Abbreviated (EPQR-A). The FM group showed higher levels of neuroticism and no significant difference on psychoticism and extroversion levels. Finally, two studies focused on specific aspects associated with personality psychopathologic traits. The first study [48Lundberg G, Anderberg UM, Gerdle B. Personality features in female fibromyalgia syndrome. J Musculoskeletal Pain 2009; 17(2): 117-30. [http://dx.doi.org/10.1080/10582450902820531] ] compared the personality core-beliefs in patients with FM and major depressive disorder, showing an absence of specificity on these characteristics. The second one [23Kayhan F, Küçük A, Satan Y, İlgün E, Arslan Ş, İlik F. Sexual dysfunction, mood, anxiety, and personality disorders in female patients with fibromyalgia. Neuropsychiatr Dis Treat 2016; 12: 349. [http://dx.doi.org/10.2147/NDT.S99160] ] instead analysed the role that personality disorders may have in predicting the quality of life of people with rheumatic diseases, showing that it could affect both quality of life perception and coping strategies. Personality traits are often studied in patients with rheumatic diseases and, most of all, in those with fibromyalgia. However, the literature on this topic presents inconsistent results. The proposed systematic review underlines some specific characteristics of the recent literature and highlights some relevant key-points for future researches. Firstly, there were many differences in the definitions of fibromyalgia and also in patient recruitment in the studies. Some authors only enrolled participants who were referenced in diagnosis, while some others used patients with a diagnosis formulated with ACR criteria of 1990 [17Wolfe F, Smythe HA, Yunus MB, et al. The american college of rheumatology 1990 criteria for the classification of fibromyalgia. Arthritis Rheum 1990; 33(2): 160-72. [http://dx.doi.org/10.1002/art.1780330203] [PMID: 2306288] ] and yet others with ACR criteria of 2010 [21Wolfe F, Clauw DJ, Fitzcharles MA, et al. The american college of rheumatology preliminary diagnostic criteria for fibromyalgia and measurement of symptom severity. Arthritis Care Res (Hoboken) 2010; 62(5): 600-10. [http://dx.doi.org/10.1002/acr.20140] [PMID: 20461783] ]. Secondly, personality is studied under many aspects and a reference model is not always present. Many studies underline high levels of alexithymia and type D personality in FM patients but when depression is controlled, these results do not differ from those of healthy controls. Studies that use a comprehensive model of personality present a different theoretical approach and use alternatively the Big-Five model, Eysenck’s and Cloninger’s models. Obviously, when the theoretical model of personality changes, also the measures change, and that could explain the difference found between results. Therefore, the contrasting results are probably due to the use of different explicative models and diverse measures of personality. Malin and Little [40Malin K, Littlejohn GO. Personality and fibromyalgia syndrome. Open Rheumatol J 2012; 6: 273-85. [http://dx.doi.org/10.2174/1874312901206010273] [PMID: 23002409] ] observed that the scientific research examining personality characteristic in FM patients is limited by the differences in instrument design as well as by the limited data on clinical aspects of FM patients. They also did not find any study showing a specific personality profile in FM patients. In the study of Lundberg et al. [48Lundberg G, Anderberg UM, Gerdle B. Personality features in female fibromyalgia syndrome. J Musculoskeletal Pain 2009; 17(2): 117-30. [http://dx.doi.org/10.1080/10582450902820531] ] both aspects, such as temperament and character, of Cloninger’s TCI test were found different in FM personality. In some cases, personality is studied in terms of psychopathology, with a completely different approach: Measures and results show how personality disorders can influence subthreshold dysfunctional traits. In these cases, personality is conceptualized as a feature, affecting patients’ quality of life and their response to treatment in general. Although in many studies FM patients are compared with healthy controls and personality differences are found, when comparison is made with other disorders with controlled depression, personality traits appear to be less relevant than before. From this analysis, for future research, the relevance of a clear definition of fibromyalgia is evinced, together with the necessity to enrol participants on the basis of more recent criteria. Moreover, the use of a comprehensive model of personality and of psychopathological disorders, such as anxiety and depression, seems to be very relevant for a better understanding of a specific personality profile associated with fibromyalgia, also because of the high prevalence of Axis I psychopathologies in FM patients [45Bagby RM, Parker JD, Taylor GJ. The twenty-item toronto alexithymia Scale: I. Item selection and cross-validation of the factor structure. J Psychosom Res 1994; 38(1): 23-32. [http://dx.doi.org/10.1016/0022-3999(94)90005-1] [PMID: 8126686] ]. Obviously, some limits are present in our study: Our choice of scientific databases, such as PsycInfo and PubMed and the inclusion criteria (such as the English language), could exclude important studies in the field. Furthermore, most of the studies include female participants and thus no gender differences are controlled. For future research, it might be useful to extend the analysis of the literature on this topic, focusing on gender differences in personality aspects and their relationship with fibromyalgia. Di Tella M, Enrici I, Castelli L, et al. Alexithymia, not fibromyalgia, predicts the attribution of pain to anger-related facial expressions. J Affect Disord 2017; 227: 272-9.